My elderly friend gave me this tip today and I am sharing with you all today. I made the picture to illustrate. 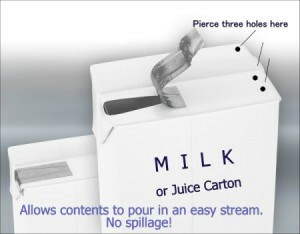 He pierces 3 small holes at the other end of the carton, away from the opening. He says that this will stop that awful splutter of liquid from going everywhere when you open these types of cartons (usually containing milk or fruit juices). It helps the stream of liquid pour smoothly. I think this is a great idea as, before now,that spillage ALWAYS happened to me and wastes what I have paid for.